Entrepreneurs are psychologically unique. In a world where up to 90% of startups fail, the most enduring visionaries will push through, energized by the idea of experiencing freedom and success alongside the 10% who beat the odds. They’re resilient. They’re adaptable. They’re extreme risk-takers. The most successful entrepreneurs tend to run toward uncertainty and threat instead of running away. Why? The reason, at least according to psychologists, is that successful entrepreneurs tend to have one mindset about fear that the rest of us simply don’t share, at least not to the same extent: If harnessed in the right ways, understanding our fears and anxieties can lead us to breakthrough self-discoveries, innovation, and creativity. For exceptional entrepreneurs, noticing fear is a competitive advantage; it’s an emotion that we dive into with curiosity, passion, and a hunger for exponential growth. The good news is, these critical mindsets around fear can be learned. Serial entrepreneur and executive coach Justin Milano has experienced success and failure — but it’s the failure that changed his life. “I was building a company to solve one of the greatest environmental challenges we face today: food waste,” he says. Then, his greatest fear became a reality. The company failed, and in the soul-searching that followed, he saw his motivations in a truer light. “I realized there was an unconscious part of me looking to do something grandiose because I didn't fully value and love myself. I was trying to prove my self worth.” He wasn’t afraid of his business failing, he was afraid of feeling like a failure. There’s a big difference between the two, but they’re often strongly related. At least, that’s what Milano learned after a satisfying bit of symmetry. What seemed like his greatest failure led to his greatest success: co-founding Good Startups, an executive coaching company for startups that focuses on cutting-edge leadership psychology, neuroscience, and emotional intelligence. What he had started to understand intuitively, his eventual cofounder, Dr. Daniel Cordaro, Director of Wellbeing at the Yale Center for Emotional Intelligence, had already been studying across cultures for nearly a decade. 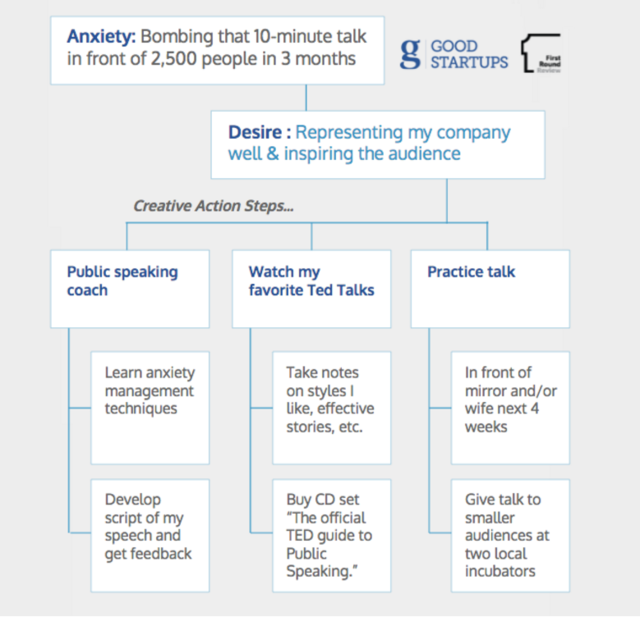 In 2015, they teamed up to use their mix of scientific expertise and on-the-ground startup experience to help founders and their teams identify and manage their fears and anxieties, and more importantly, understand the deeper psychology blocking them from self mastery and sustainable high performance. There are a lot of entrepreneurs out there unconsciously trying to prove their self-worth through their companies. When you practice and master these tools, the result is better decision-making, expanded performance and energy, more inspirational leadership, and a doorway to self-mastery. It’s scientifically evidenced. I’m an old man and have known a great many troubles, but most of them never happened. The key point is that 99% of the time when people say they are experiencing fear, they are actually experiencing anxiety around events that may never happen. When this anxiety is playing like a broken record in our subconscious mind throughout the day, we are hanging out in our limbic brain, specifically the amygdala, which is responsible for our reactions to threat. When we are seeing the world through the lens of threat, we experience tunnel vision and limited possibilities. Once you recognize that what you are experiencing is most likely anxiety, the question becomes how do you release the grip of anxiety so you can operate with expanded awareness and creativity? What expectation, idea, or outcome are you attached to? A specific investor? A specific client? A certain type of product working? Being cash positive in six months? What identity is driving the attachment? Have you created an image of yourself as the next game-changing entrepreneur to investors, the press, and your team? Consider this example: A founder tells her investors that the company will be cash positive in six months. Then inevitable obstacles set in, and it becomes clear that goal is unattainable. It would be easy to descend into a morass of anxiety and what-ifs: Will the board let me go? Will the team start questioning my leadership? Attachment to identities can be harder to relinquish, but it’s critical to consider. Many founders, whether through their own strategy or the attention of the press, assume the mantle of “the next big thing.” Suddenly, they’re not just building a product and running a company, they’re living up to very public expectations. “Now if your product launch isn't working very well, it starts to threaten that identity. Not only is your product broken, but you’re a fraud, a common human fear. That’s one of entrepreneurs’ biggest fears: I went out there, I sold all these friends and investors on the next big thing, and it didn’t work. I’m a fraud. The Culture of Scarcity: The belief system that there’s not enough resources (e.g. time, money, etc.). When working with clients, Milano and Cordaro take people deep into their individual scarcity programming to write new, more empowering stories for their lives. Adopt this mindset, and fear stops looking like a threat; it’s merely part of the package. In Milano and Cordaro’s experience, the following shift in mindset can have a profound influence on founders. When a product fails, when the new app gets two stars in the App Store, when funding isn’t coming through, successful founders don’t get caught up thinking, “This is the wrong experience. This isn’t the way it’s supposed to be.” Instead, they accept those obstacles as part of their experience — the only one they can and should be having. They use the experience as a growth opportunity to become better, stronger, and more inspirational leaders. “When your product isn’t working, you need that feedback in order to actually create a product that people do want,” says Milano. Anxiety lets you know when you need to kick into gear. The problem, Milano notes, is when you simply stew in anxiety all day, every day. These emotions will not serve you well if they become chronic. And where there is chronic anxiety, there is almost always avoidance or aversion. That app with the two-star rating? Customers don’t like it — it needs to change. “The person with a healthy relationship with fear can say, ‘This is what's happening. I'm going to accept that, embrace that, and receive the information. Now what can I do creatively to solve this?’” says Milano. Leaders with an unhealthy relationship to fear, on the other hand, often lose the opportunity to course-correct. Stuck on how things “should” go, they miss the valuable signal that it’s time to pivot. Moreover, avoiding feelings of fear only prolongs them. “All emotions are here to provide us with information about the world around us. That's why we've evolved to feel them. Emotions are data; they’ve helped us survive for tens of thousands of generations. If we're not listening to an emotion, if we're not receiving that data fully, it's going to keep coming,” says Cordaro. When you allow yourself to fully feel and accept an emotion, it dissipates very quickly, often in as little as 30 to 90 seconds. Be an example for your team: Entrepreneurship is a roller coaster. Let’s accept that and fix what we can. There will be no freaking out. The final culture of fear is the Culture of Unworthiness. “This one goes beyond entrepreneurship, it is an epidemic of the human species,” says Milano. The belief system is that “I’m not enough just the way I am, I need to achieve something extraordinary to generate fulfillment.” This is the culture that had hit Milano the hardest so many years ago. Milano offers that one of the quickest ways to determine if you have some work to do around your own sense of worthiness is to ask yourself the question “If my company completely fails and I fall flat on my face, will I still love and accept myself unconditionally.” When Cordaro and Milano ask this question in their virtual group coaching sessions you can often see people stop breathing even through the video conferencing technology. "It’s a powerful and shaking experience," Milano says. “When we are faced with the loss of our dreams and ideals, a natural response is a feeling of low self worth,” says Milano. For him, this was the greatest gift of his food waste startup failure. Once you do the courageous work to defuse your unique sources of anxiety, you are then free to transform your anxiety into something far more useful, like creativity and innovation. Cordaro shows us how to do this through cutting-edge neuroscience. Terrified of public speaking? That’s because you desire to share a compelling, well-articulated message. Worried you won’t get funding? That’s your strong desire to raise money and build a successful business. Afraid of failure? What’s underneath that is your desire to have a positive impact on humanity. This isn’t just a hunch; it’s actually deeply rooted in neuroscience. Most of us are at least vaguely aware of the amygdala, that part of the brain, right behind the temple, that perceives threats — the “fight or flight” portion of the brain. When the amygdala perceives a threat, one of its jobs is to stop sending information to the cortex, where we engage in higher level thinking and rational decision-making. What most people don’t know is that right next door to the amygdala is the nucleus accumbens, which is responsible for desire and all things that make us crave feeling good. “Scientists have tried to find where the nucleus accumbens stops and the amygdala begins, and they can't find it. These portions of the brain are intrinsically involved with each other. When the amygdala fires, the nucleus accumbens is firing as well,” says Cordaro. A healthy relationship with fear is the doorway to the part of your brain that optimizes judgment, decision-making, and creativity. Milano and Cordaro developed a five-question exercise to help their clients understand what their anxiety is telling them in the moment, and shift toward consciously pursuing their creative desires. Why is this process important? Very simply, it gets your brain unstuck from fear-based, animalistic reactions and allows you to rapidly shift into creative problem-solving mode. What's the fear or anxiety? 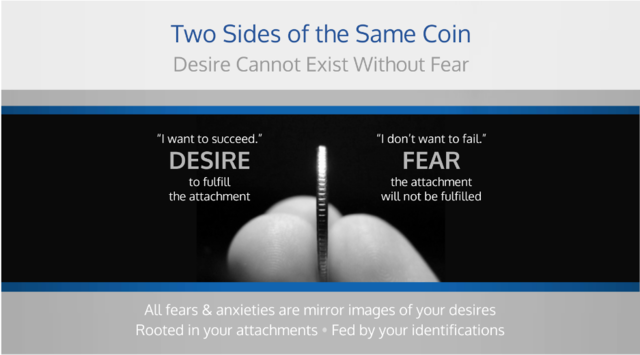 What is the desire being mirrored? What is the desire underneath that anxiety? Once you discover the desire, do you choose to take action on it? If so, what are the creative action steps? Let’s put this system to the test by bringing in a real life example of the number one most feared concept across all of humanity (it even beats death) — public speaking. In a few months, you’re going to give a high-profile talk regarding your company’s vision on stage in front of 2,500 thought leaders and influencers. Anyone would feel some level of anxiety, especially for those of us who aren’t public figures for a living. What’s the fear or anxiety? This should be an easy one, but this is where awareness begins. Failure. Bombing the talk. Being the subject of ridicule and scorn, or even worse, silence, from this massive audience. Missing an extraordinary opportunity to inspire major influencers in your space. So you’ve gone through the process of understanding fear, uprooted your cultures of fear, and transformed your fears into desires. But how do we deal with in-the-moment spontaneous feelings of fear that may arise, let’s say, in the middle of your talk when someone asks a piercing and unexpected question? In Milano’s experience, there are several common physical experiences that are dead giveaways you’re having a fear reaction: sensations in the belly, sweaty palms, increased heart rate, rapid breathing, and even accelerated speech. Become adept at recognizing these physical manifestations, and you can also develop the skills to overcome fear as it strikes. Whether you’re standing at a podium or opening an investor email that’s unlikely to contain good news, a few simple actions can jog you out of paralysis and into presence. Milano and Cordaro offer three examples here. Breathe: You’re about to get on stage for your talk, and you feel like you might hyperventilate and forget everything you wanted to say. It’s time to breathe. Get comfortable and close your eyes. Feel yourself breathe cool air in through your nose and exhale warm air through your mouth. Repeat this for a few breaths, then open your eyes and notice the space around you. Move: You make it on stage and are about to begin, when you feel a crippling paralysis. Your knees are frozen, and you have that deer-in-the-headlights look on your face. It’s time to move. When your body freezes in fear, by gently wiggling, shaking, or bouncing you can stop that fear in its tracks. If you are feeling the adrenaline rush of a “fight or flight” response, plant your feet firmly on the ground to experience that sensation of rootedness, like a redwood tree. These simple body movements are fear “pattern interrupters” developed by Milano’s friend Dr. Kathlyn Hendricks, who is an expert on Body Intelligence. Research shows that the second you match your experience by saying ‘I'm excited,’ your nervous system relaxes. Just as founders need to recognize fear in order to move past it, they also need to recognize creative energy so they can welcome it with open arms. Here, too, the body offers the most reliable indicators: “You feel spacious, balanced breathing. Your gut relaxes, and your adrenals and heart chill out. You begin having fun, seeing more possibilities, generating a sense of trust, and the world looks friendly. You make clear decisions from a place of balance,” says Milano. The goal of meditation is not, as many people assume, to be more calm and peaceful (although those are certainly positive side effects that you can expect from a regular practice); it’s to see one’s experiences through a different lens. One of the main reasons we engage in mindfulness practices is to sharpen our attention muscle so that when these feelings of fear and anxiety come on, we can catch them at a much earlier stage and simply let them go. Then, in turn, you can choose how you will respond, prioritizing the actions that will most benefit your unique offering to the world. The reality of emotional intelligence, is that it needs to be developed. As with any new skill, it takes practice; new muscles must be flexed. But as you do that, you will begin to find your relationship to your work, and your colleagues, meaningfully changed. Herein lies the competitive advantage of fear, understanding it, and learning how to transform its energy into massive creative potential.